Episode 5.09 – Namaste – Losties In Dharma In Jumpsuits!? After the Thanksgiving holiday, the LOST cast and crew were hard at work again, but this time in Othersville. 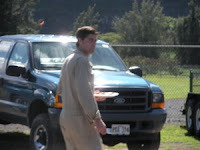 Today’s set report is via Grant, a LOST fan from Canada that visited the set and provided our good friend Ryan from Hawaii Blog with the details of what they were able to see. No filming was witnessed, but Grant and his lucky wife were able to speak with Evangeline Lilly and some VERY interesting details have been discovered including which cast members were on set and what they were wearing! They learned that four of the six Oceanic 6 members (Kate, Jack, Sayid and Hurley) plus two on-island Losties Jin and Saywer were on set with Sayid in plain clothes, Kate in a blue jumpsuit and the other four apparently wearing tan Dharma jumpsuits!? Several other actors and children were a part of the shoot in the jumpsuits and several new Dharma VWs, a jeep, and bikes were also spotted! So is this all a part of a time jump!? Is it present time and the Oceanic 6 have already made it back to the island!? Is this another confirmation Jin is alive?? Has Dharma been “re-populated”!? For some reason I feel it is somehow part of the time jump, but I am still trying to digest all of this. So what do you all think is happening!? Below are a couple of pics, but make sure you check out the full set report and more pics at Hawaii Blog. 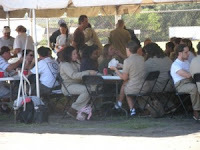 If you look carefully at the crew eating lunch it looks like you can see Hurley in the Dharma jumpsuit and Sayid in plain clothes. NOTE: Earlier today we learned that Episode 5×09 is currently being filmed so expect all of this to appear around then.